What are step-mothers really like? Mary was a girl of five years old. She had never known her real mother. She was brought up by her daddy and her grandmother whom she called Nanny. Mary loved her Nanny and her dad very much. She didn’t know her dad was lonely and needed to have a wife. Nanny used to read bedtime stories to Mary. She especially liked Snow White and Cinderella. She used to pretend she was Snow White sometimes. She would take a bite of a red apple and then fall on the ground and pretend to be asleep, waiting for a prince to wake her up with a kiss. She used to call her dad to come and give her a kiss, which sometimes he would do, and then she would be happy ever after. But sometimes Daddy was too busy and she had to wait until the dog saw her lying on the floor. He would always give her a kiss, even though he wasn’t supposed to lick her! She would wipe her face and then give the dog a big hug. One day daddy brought a pretty lady home. She brought a present for Mary. Daddy said he was going to marry this lady called Sue. He said that Mary needed a mother and he needed a wife. She would be Mary’s step-mother. 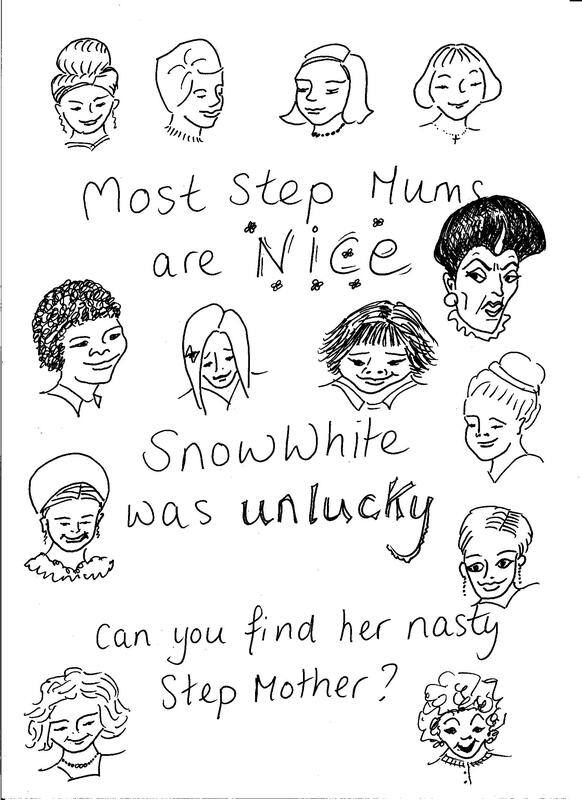 Now the only time Mary had heard about step- mothers was when Nanny read her the fairy stories about Snow White and Cinderella. Mary became worried. She thought that Step-Mother was the same as Wicked Step-Mother. Mary got quite upset. She hid behind the sofa. She didn’t want to have a wicked Step-Mother. Nanny asked Mary what was the matter. ‘I don’t want to have a wicked Step-Mother’ said Mary in a sad voice. Nanny went on to tell Mary that you can only ever have one real mother and she is the person who gave birth to you. You grew inside her tummy and when you were ready, out you popped, all new and slippery. And do you know what? They were all very happy and lived happily ever after. How many nice step-mums can you see?